Holiday shopping can be a budget buster. One way to save when shopping online is with coupon codes. 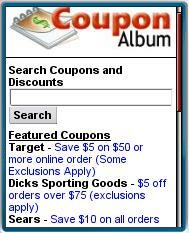 Coupon Album, one of the larger coupon sites on the web, now has a mobile friendly version. It’s a simple, low bandwidth site which should work on all phones. It has a dozen featured deals on the front page, but if those aren’t helpful head Coupon Album’s best feature, the search box. There are a number of mobile coupon sites but surprisingly Coupon Album is one of the few that offers a search option. In my tests the search returned quite a few relevant deals for common queries like “cameras”, “Amazon”. Searching by store name seemed to work better than by product. This entry was posted in Shopping and tagged mobile site review, online coupons by Dennis Bournique. Bookmark the permalink.